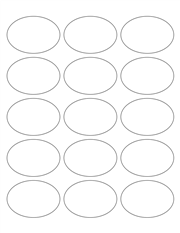 COMMENTS: These labels are great for my oval shaped lotion bottles. Plan on using for my new body wash. I especially like that there's a Word template to print the labels. Saves me a lot of time. "How do you keep the ink from smearing on Glossy Labels? Please let me know." Staff Answer You need to use a laser printer only. Using an ink jet will smear the print on the glossy labels. "When I try to look at the software for glossy labels 2.5x1.7 it brings me back to the page I started with." Staff Answer We apologize that this was missing from our website. We have fixed this issue and you should now be able to download the template. "I ordered these labels, but I design my labels in Avery.com and there is not any avery labels that match this. Can you tell me how to design these or I need to return them.. Thank you.."
Staff Answer There are templates for each label under the "MSDS & Docs" tab. You can download these to your computer to print your labels. "Is there any template in a computer program that you can enter info into to make designing easier? Like word?" Staff Answer There is a template that you can download for the label. Here is the link for this on our website: http://www.wholesalesuppliesplus.com/products/11268.aspx.